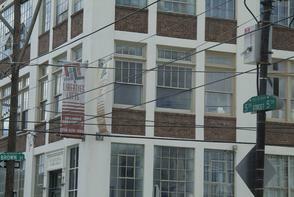 This building, built in 1924, housed the Bisler Paper Box factory. Gustav Adolf Bisler and his brother Emil started the company in 1874, when Philadelphia was the largest producer of paper boxes in the United States. At its height, Philadelphia's paper box industry employed up to 1,900 men and women who made boxes for everything from hosiery to candy. G.A. 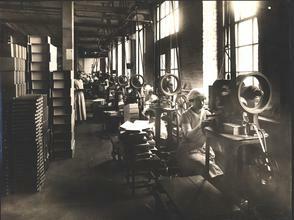 Bisler most famously made boxes for Philadelphia-based Whitman Chocolates and, later, for General Mills. Developers have bought the building and plan to convert the four-story, 90,000-square-foot concrete structure into loft apartments. The multimillion-dollar complex, called Liberties Lofts, will also feature office space, public storage units, and a roof garden. 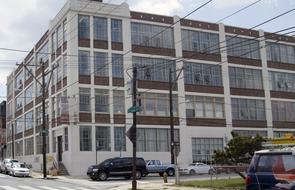 This is one of many examples of the conversion of Northern Liberties' old industrial sites into mixed-use (residential/office/retail) complexes. 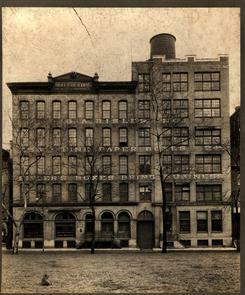 This building was designed and built by Philadelphia's William Steele & Sons, a firm known for pioneering fireproof, reinforced concrete construction. Developers bought the building from its last commercial owners (Gershel Brothers, a store fixtures and display case distributor) in 2002. They preserved and restored many of Steele's original features, including the terra cotta ornament along the brick parapet. The dilapidated relics of the neighborhood's former industrial became the raw material for a post-millennial real estate boom—a "boom" that may again displace longtime or lower-income residents of the neighborhood. Commercial and residential revitalization also presents challenges in the form of gentrification and the unequal distribution of newfound prosperity. Rampant development, higher housing costs, and a dearth of affordable basic amenities could eventually overwhelm the neighborhood's unique mix and obscure its diverse history.